We all know the Northwest is known for its rain, but when the sun finally comes out, so do the rainbows! Legend has it there’s a pot of gold at the end…but I think there’s something else hiding under there. Unicorns! It’s no secret that the wild unicorn trend has taken the country by storm. 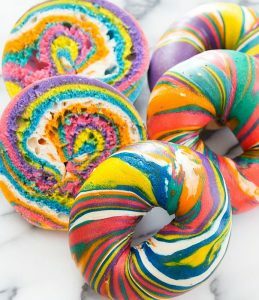 Restaurants all over the place are serving up unicorn inspired lattes, cakes, bagels, and more. The colorful creations are truly a sight to see. So what does it take to be a unicorn food, you ask? Glitter, sprinkles, shimmer, and bright colors of course! The crazier, the better. But you don’t have to go out to enjoy this whimsical trend- get creative and try it at home. Jazz up your next party with cupcakes covered in edible glitter. Or how about a glitter rimmed cocktail- now we’re talkin’! And you don’t have to stop there – top an ice cream sundae with a heaping handful of cotton candy. Sprinkle some luster dust on fresh fruit for a fun twist. If you’re feeling extra crafty, use food coloring to make unicorn butter or whipped cream! Top it on waffles, pancakes, or muffins for a wacky breakfast treat. 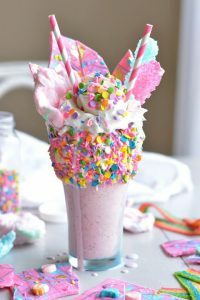 And if you really want to get your Unicorn DIY on, check out the fun step by step instructions on how to make a Unicorn Bark Milkshake on BethCakes blog – if anything it will make you smile! 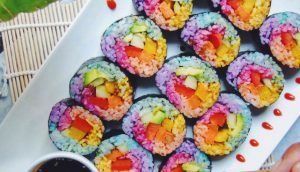 So whether you have kids of your own- or you’re just a big kid at heart- the unicorn food trend is the perfect way to bring a little magic to your day. Calling all cocktail enthusiasts! What do you get when you combine thousands of mixologists, spirit industry professionals, bar enthusiasts, and a lot of libations together? Tales of the Cocktail, of course! Think of it as a five day summer camp for the best and brightest in the spirits industry. Held annually in New Orleans, the week features seminars, parties, and cocktailing galore in this boozy 24-hour playground. It can be a liver workout – trust me! Mixologists from all over the country (including local NW bartenders!) put their skills to the test by participating in crazy cool competitions. And when you need a break from all the booze- there are tons of unique bookstores and gift shops to explore. Not only is the festival SO much fun, it’s the best way to find out the latest and greatest trends in the spirits industry. And good news- tickets are open to the public! So if you’re looking for a reason to expand your liquor knowledge and visit NOLA- Tales of the Cocktail is the perfect excuse. Can’t make it this year? No problem! 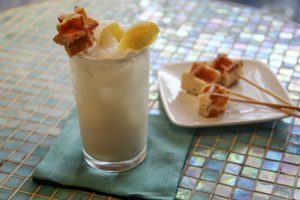 You can still get in the spirit by making my d’lish Maple Ramos Fizz cocktail at home. For ticketing information, visit their website. And follow along with me on Twitter @KathyCaseyChef – I’ll be tweeting everything Tales direct from New Orleans next week! Maple adds another layer of flavor to this classic brunch cocktail. Try Sipsmith Gin with a splash of maple syrup over ice as a sipping alternative. For a whimsical garnish, purchase sugared waffle crisps cut into small wedges and skewer onto long bamboo skewers. Measure the gin and Maple Ramos Pre-Mix into a mixing glass. Fill with ice, cap and shake vigorously to really froth the drink. Divide drink between 2 tall (Collins style) glasses, and top with a splash of soda water to fizz (about 1 ounce for each drink). Twist lemon over drink to express oils and garnish. Combine all ingredients together in a pitcher and whisk vigorously to combine, being sure egg whites are mixed in. Refrigerate for up to 2 days. Stir well before using. *To make simple syrup: combine 2 cups sugar and 2 cups water in a saucepan, bring to a quick boil then remove from heat. Cool. Store refrigerated for up to 10 days. Makes about 3 cups. Recipe from Kathy Casey Food Studios® and Published in Sip NW Magazine.